Beirut Diary: I’m in Beirut for the week as part of The E-Mediat project, a capacity building project that leverages a networked approach. I’m the lead for Zoetica where my role is to deliver training, advise on the curriculum and coaching methods, model transparency, and serve as meta network weaver. I have the honor of co-training with some of the best folks doing work in this part of the world. The E-Mediat project is sponsored by MEPI, US Department of State’s Middle East Partnership Initiative and was created in response to Secretary Clinton’s announcement of Civil Society 2.0. The project is being managed by IIE and builds on a highly successful program launched in the Middle East five years ago, Women in Technology that trained over 10,000 women from 9 countries in the Middle East and in collaboration with over 60 training partners. A true public/private partnership, the funding partners include Microsoft and craiglist Charitable Fund. 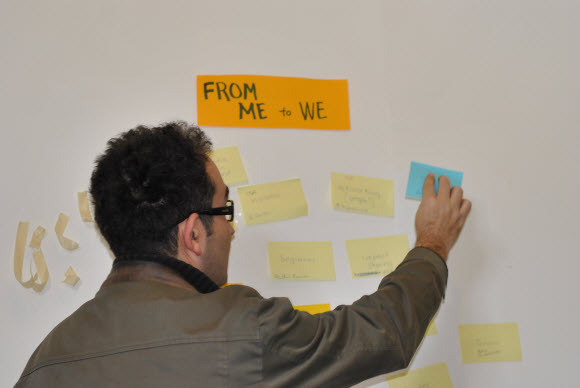 Today in Beirut there were peaceful protests, but in another part of the city the E-Mediat project participants gathered for the first day of the Train the Trainers eight-day workshop. It was very exciting to finally meet people on the In-Country Leadership Teams face-to-face. 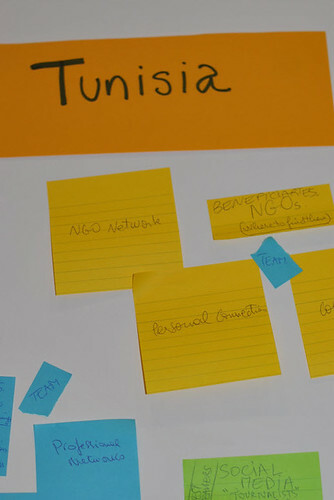 The group has an impressive breadth and depth of expertise, including NGO capacity building, social media expertise and training design and delivery. As the instructor, it felt a lot less like training people – and more like a peer learning, professional development experience. I ended the day inspired and optimistic (although pretty jet lagged) about the potential impact of a networked capacity building project in this part of the world. I was also impressed by the energy in a room with twenty people who have a networked mindset, leadership skills, and social media expertise. We have a lot to learn about working this way from NGOs and capacity builders in the Arab world. 3. To model and practice integrating the use of social media tools and networked approaches to document, deliver, and share learning. Day 1 included a detailed project orientation as well as a design discussion about the online learning community site lead by Andrea Burton from Meedan, a partner in the project. The overall theme for Day 1 was networks and how in-country teams can apply a networked mindset to developing their training programs in each country and share learning beyond geographic boundaries. Since modeling the use of social media to document and share learning, we began with a discussion about our rules about live tweeting and posting photos. On the one hand, transparency is an important networked mindset value, although it has to be balanced with privacy and security needs. For example,we agreed that we could quote those who are tweeting and have open accounts, but our tweets would not attribute quotes. 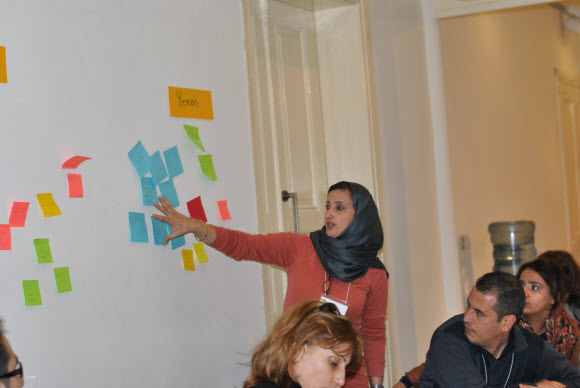 In the morning, we did a team building exercise to better understand the network core, the in-country teams from Yemen, Morocco, Lebanon, Tunisia, and Jordan. The idea was that if we knew each other’s knowledge and skill related to the project, it can help everyone can be more effective in delivering the social media training because one person or team doesn’t need to know everything. 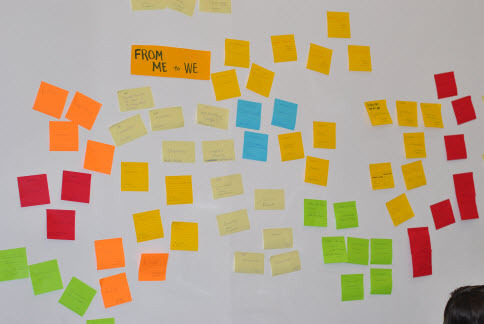 Building a solid core, participants can use social media tools to easily connect NGOS with new people who have knowledge, resources, and ideas to share to help with the project goals. * What are the points of connection? * What are the opportunities for reciprocity? 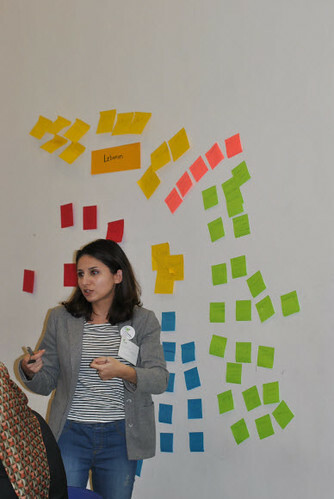 This was an opportunity for each of the in-country teams to create an ecosystem map of their networks to identify resources for the project including social media expertise. 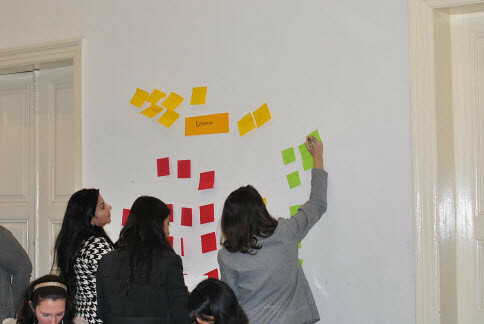 I was struck by how the teams immediately adapted and localized the mapping exercise for their country. In addition, I was struck how the “networked mindset” was something embedded in their way of working. 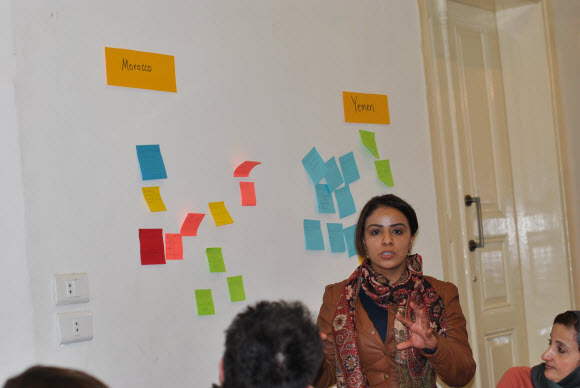 I was impressed with the array of maps and networked strategies that emerged on the walls and rich discussion that followed about network strategies and how to adapt this exercise for the training with NGOS. The Train the Trainers also included “laptop time” for participants to write reflections in their blog journals for the project. We were challenged several times with the loss of electricity and slow internet. 1.) 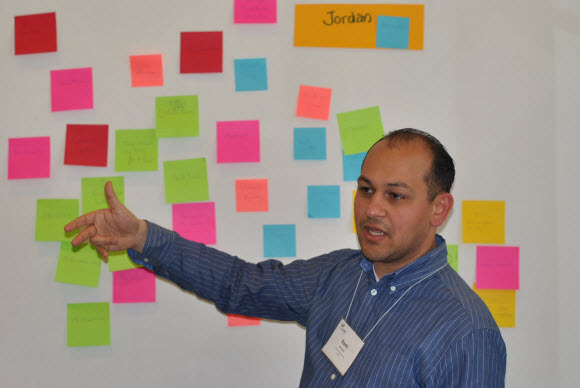 This is an extraordinary of group of capacity builders and social media experts who understand what it means to design and deliver a program in networked way — that they don’t necessarily have to own the complete to do list, just the outcomes. 2.) 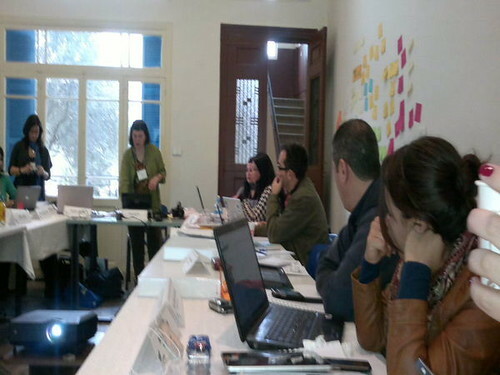 There are different types of NGOS in the Arab World. One was described as a “classic” NGO that is less likely to be open to networked model and social media. The other type of NGOS are those are born on Facebook and work in a networked way naturally. The challenge is how to design training to accommodate both. 3.) 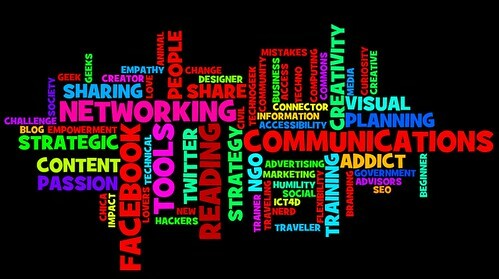 NGOs that are not using social media or thinking in networked ways, may be resistant to the idea at first. To help change attitudes, modeling is important as well as sharing stories of what similar organizations have accomplished. 4.) There are different “social media mindsets” – two distinct approaches — activist or revolutionary organizations and civil society organizations that may use social media for advocacy. 5.) There is an interest, even hunger, from NGOs to be able to learn across boundaries and language about their trade craft of using new media, social media, and other technologies to realize their missions. These exercises provided a good context for the discussion on the online learning community site. 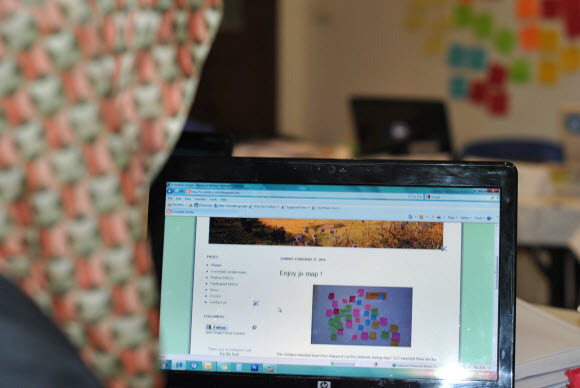 The site will be a place for the in-country teams to share learnings across geographic boundaries and the ability for translation from/to Arabic/English for team partners, but also for the NGOS in each country to access the curriculum and materials for the workshops that the trainers will deliver. One challenge in the design is to avoid creating silos or firewalls to learning between NGOS from the different countries. We ended the day with appreciation and a gratitude circle, so we were able to thank each other for what we learned. Hi Beth, we are so lucky to have you as a trainer, coach and advisor. Today is our fourth day and what an amazing program! Tunisia is lucky to be included in the e.mediat targeted countries. Perfect time for a perfect project. I am glad that I recieved such great training from you! It was a great pleasure meeting you in personal!